Mon., Feb. 2, 2009, 8:40 a.m. The talking heads today are occasionally talking about Jennifer Hudson's story, about her compelling performance of the Star Spangled Banner before the Super Bowl yesterday, and some even mentioning the murders of her mother, brother and nephew who were brutally murdered in October of last year, ostensibly murdered by the singer's brother-in-law, William Balfour, who has been charged in the crimes. 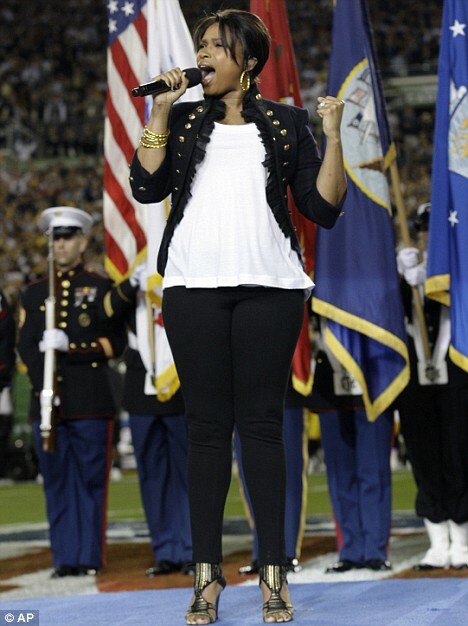 Despite the fact that Jennifer Hudson lip-synched her performance yesterday, as that is an order of the NFL, she gave the performance of a lifetime before an audience of billions around the globe. The hulking football players, great clad heroes of the coming battle, appeared to be touched, as was I. However, the truly greatest significance of Jennifer Hudson's performance came not from her considerable talents and tremendous vocalization. No, for what brought tears to my eyes, insufferable old sentimental poop that I am, is that after countless wars, thousands of young people in far-off lands willing to give their lives for their country, and all the strife and anguish that it implies, Old Glory, our great American flag is still there, floating in the breeze, to give us all pause to consider how very fortunate we are. For a time there, a mere dot in the face of history, perhaps others were reminded of the great sacrifices that flag represents, and we as a Nation might be grateful to be here, and to live in the greatest free country in the world.